Zumub Banana Chips is a crunchy treat that can take its due place in your nutrition plan if you stop to read about what makes them a great snack. 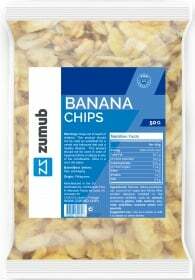 The true virtue of products is what matters to us here at Zumub, so we offer a full disclosure of our Banana Chips. On average 100g of Zumub Banana Chips can constitute around 20% of the daily calorie intake which mainly derives from fats and carbohydrates. No matter how much these two are demonized, they are no less important than protein and fiber for example, especially because they are necessary to give energy to the body, being a good snack to recharge you with energy. Naturally composed by magnesium and potassium - essential elements vital for overall well-being. Convenient to have on the go or replace a dessert. Sweetened with honey - a healthier and less caloric alternative to sugar. Produced in EU in compliance with strict quality standards. 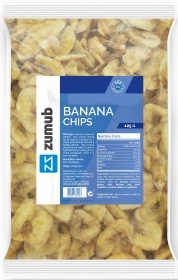 We created Zumub Banana Chips to diversify your diet in a delicious way. Enjoy their sweet crunchiness without any concerns. Have a question about Banana Chips? What is it, what does it do, how and when to use or something else? Ask us. ALLERGEN INFORMATION: May contain allergens handled in the production facilities, such as cereals containing gluten, milk, lactose, soy, nuts, sulphites, peanuts or sesame seeds. Use as a snack or add it to salads or other dishes to boost their nutritional value. WARNINGS Banana Chips : Keep out of reach of children. This product should not be used as a substitute for a varied and balanced diet & healthy lifestyle. This product should not be used in case of hypersensitivity or allergy to any of its constituents. Store in a cool, dry place. BEST BEFORE: Please see lot number and expiration date stamped on the packaging.